After an unusual dry summer, fall colors arrived earlier this year. 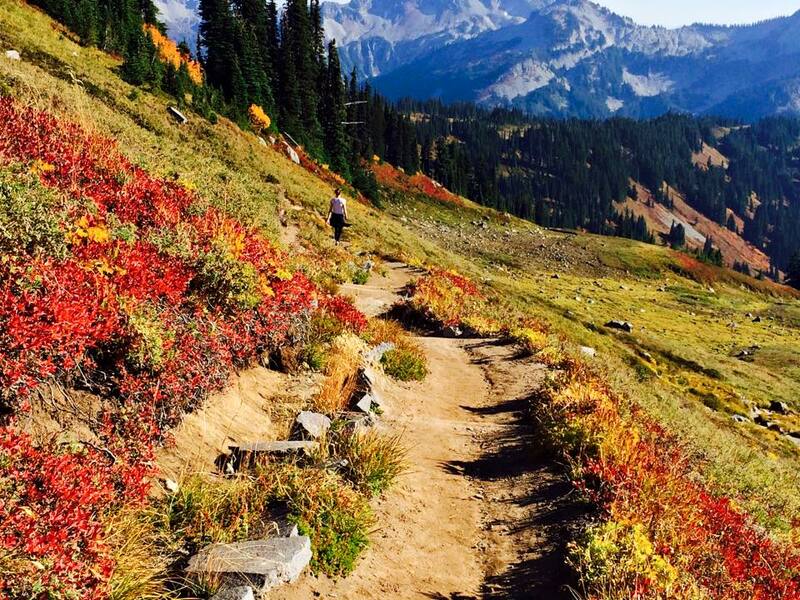 Last Sunday my friend and I went to Mount Rainier National Park. This is the first time I saw my favorite park dusted with these colors so vibrant and in such magnitude. The wild flowers in the summer simply CANNOT compare. For those of us who live in the Pacific Northwest, Autumn also means new crop apples: Fuji, Gala, Honeycrisp, Braenburn, Pinklady, to name a few, fresh from the orchards in Eastern Washington. It’s been a while since I made a puff pastry dough, so this French apple tart came to mind. There are two methods to make puff pastry: the classic way, which involves de trempe and a beurrage, and a quick method, which mixes the butter and flour together from the start. 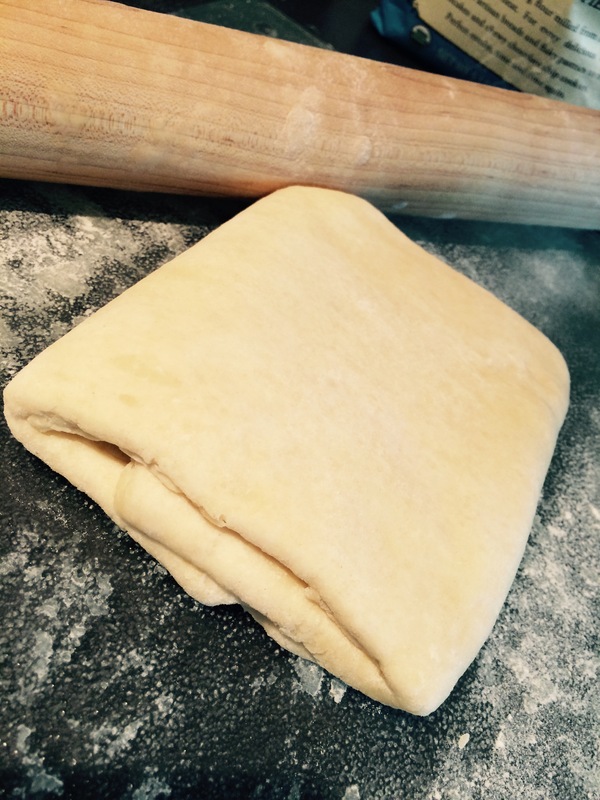 The classic puff pastry receives six turns and requires refrigeration in between. This quick method is less strict and produces the flakiness perfect for hors d’oeuvres and sweet pastries. For convenience, I translated the above mentioned recipe into US measurements, and added slight variation based on the notes I took years ago from my pastry class at L’Academie de Cuisine. The key to make good puff pastry is to keep the dough cold at all times. Start by measuring out all the ingredients ahead of time and chill them in the refrigerator. In this case, I chill the mixing bowl as well. Makes 11 1/2 ounces puff pastry, enough for one 10-to-12-inch tart. In the chilled mixing bowl, mix together flour, butter, and salt. When the mixture looks crumbly but fairly even, with the average piece of butter about the size of a pea, dribble in ice-cold water. Turn off the mixer as soon the water is added. Transfer dough onto a light floured work surface, preferably chilled. Shape the dough into a rough block, There will still be chunks of butter visible in the dough. Be careful not to overwork the dough. Roll the dough, using a lightly floured rolling pin, into a long rectangle. Add more flour as needed underneath and on top of the dough to prevent sticking. Turn the dough 90 degrees, and repeat the two previous steps of rolling and folding. Turn it again, then roll and fold. Turn it again, then roll and fold. You’ll have done this four times in total (feel free to do it 1 to 3 more times if you’re having too much fun to stop and your kitchen is cool enough). Your rectangles will get neater and neater every time. The dough can be refrigerated up to two days and freeze up to one month. Puff pastry can only be as good as the butter you use for it, so now’s a good time to splurge on a European-style butter with big flavor and a low water content. This dough is best prepared in a cool environment — don’t attempt it while the oven is running! — using light and quick gestures to prevent overheating the dough. Posted on September 20, 2015 September 23, 2018 by sunnydaysinseattlePosted in Baking, Dessert, Outdoors, Pacific Northwest, RecipesTagged Apple, Apple Tart, Autumn, Baking, Butter, Caramelize, Fall, French, Mt. Rainier, Puff pastry. Pingback: Winter in Mt. Rainier – Let's Eat! Thank you Rashminotes. Hope you get to visit Mt. Rainier sometime.